The recent publication of an expanded list of alleged terrorist groups and their sponsors by the National Bank of Tajikistan highlights the country’s growing concern about both domestic and international terrorist threats. The list includes over two hundred individuals as well as fifteen organizations; including the Islamic Renaissance Party of Tajikistan (IRPT). The inclusion of the IRPT on this list is important as it further highlights the de-legitimization of Tajikistan’s only recognized Islamic political party. In the 1990s, the IRPT was part of Tajikistan’s formal political scene, with the moderate party garnering a place in government as part of the united opposition following the country’s 1992-1997 civil war. Since then President Emomalii Rahmon (who has ruled the country since 1992) and his People’s Democratic Party have slowly marginalized the IRPT, with the party outlawed in 2014, and declared a terrorist group in 2015. The fall of the IRPT has been part of the government’s ongoing campaign against Islamism and overt faith in general. Motivated by fears of radicalization, the government’s slew of heavy-handed – and at times, bizarre – measures have only increased resentment among the population and provided ample recruitment material for radicals. In recent years, Tajikistan has: shut down hundreds of non-government sanctioned mosques and preachers, banned Islamic dress in schools and offices, limited public prayers, shuttered 160 stores selling Islamic clothing, banned children under 18 from mosques, restricted students from studying Islam abroad, and made it difficult to register Muslim organizations. In 2015 the government even went as far as to forcibly shave 13,000 bearded citizens. These measures have been directly cited by radicalized Tajiks as the motivation for their decision to join radical groups. A major blow to the government came in 2015 with the defection to ISIS of U.S-trained special forces commander Colonel Gulmurod Halimov. Halimov has allegedly become ISIS’ supreme military commander and has been a major influence in encouraging other Tajiks to join the organization. 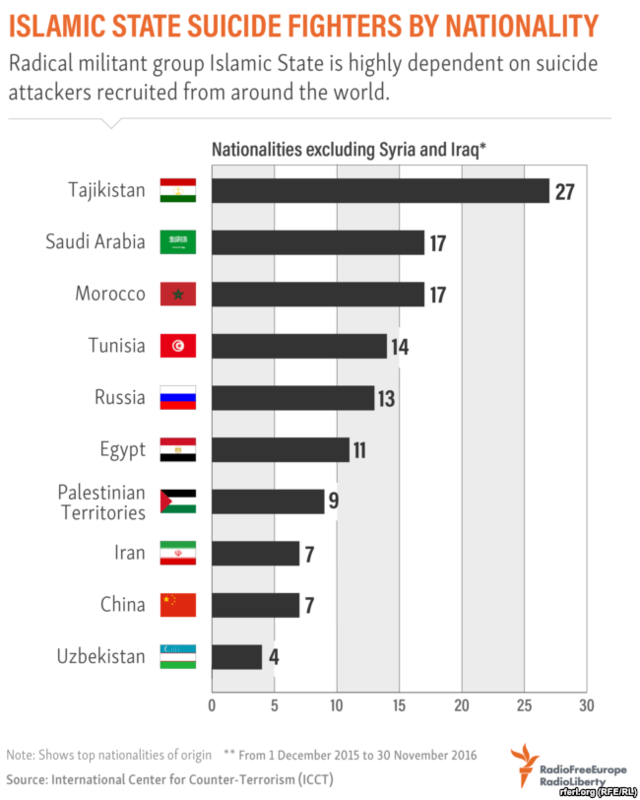 In part due to Halimov’s influence, Tajikistan has become the world’s leading exporter of suicide bombers to ISIS’s battlefields: 27 Tajik suicide operations were carried out in Syria and Iraq between December 2015 and November 2016. The irony of the situation is that “when the IRPT was part of the government, one of their main tasks was to educate people not to go to [radicals]. Once [the party was] forbidden we had an enormous increase [in the number of Tajiks joining ISIS] – students, and in one case, 40 people from the same village,” notes University of Heidelberg researcher Sophie Roche. Around 1,100 Tajiks are believed to be fighting in Syria and Iraq, with an additional 300 having been killed there in recent years. Two Tajiks were also behind the March 8th Kabul military hospital attack that left at least 49 dead. More recently, a suspected terrorist attack was orchestrated in the Tajik city of Qurghonteppa on March 12th, with an explosion killing one person near the military prosecutor’s office: Qurghonteppa’s outskirts also saw a mysterious explosion on January 30th. Only ten days before on January 20th, the Tajik interior ministry announced that the government had foiled 36 terrorist attacks in 2016, with over 400 people detained for suspected terrorist links. Tajikistan is facing a serious terrorism threat, as its citizens become radicalized at home due to the government’s hardline measures, and as hundreds of fighters in Syria and Iraq return home as ISIS loses ground in the Middle East. Alongside the recent incidents already mentioned, a Tajik native was also arrested in Russia on March 8th after authorities discovered a plan for a suicide attack in Moscow. This incident demonstrates another risk vector for Tajikistan – its large migrant worker population. Over a million Tajiks work in Russia as migrant or seasonal workers, with remittances comprising a major revenue stream for Tajikistan. Poor working conditions, abuse and a sense of hopelessness puts many Tajik workers in Russia at risk of radicalization. The convergence of these risk factors has already led to the radicalization of a substantial number of Tajiks in Russia, with Islamists using Russian social media sites like Odnoklassniki and Vkontakti to recruit followers. With Tajikistan’s economic growth slowing from 7.4% in 2013 to 3.8% in 2016, combined with an 8.5% annual inflation rate, economic hardship will force more Tajiks to seek work elsewhere, with those who stay not faring much better. Tajikistan’s economic hardship will only continue, especially with the recent cancellation of China’s Line D oil and gas pipeline. The cancellation of Line D means Tajikistan will lose out on millions of dollars in oil and gas transit fees, thus only further weakening the economy. While these problems would be more than enough for any country, Tajikistan has the unfortunate luck of being situated in the middle of one of the most volatile regions on Earth. With its entire mountainous southern border facing Afghanistan, which at its narrowest point is also only 40 kilometers from Pakistan’s tribal north, Tajikistan faces serious risks. Add to this Tajikistan’s border with China’s restive Xinjiang province and things look grim. China’s Kashgar prefecture is home to 40,000 ethnic Tajiks, and the local government is hiring an additional 3,000 police to reinforce the border as officials increasingly intercept weapons, drugs and extremist media. 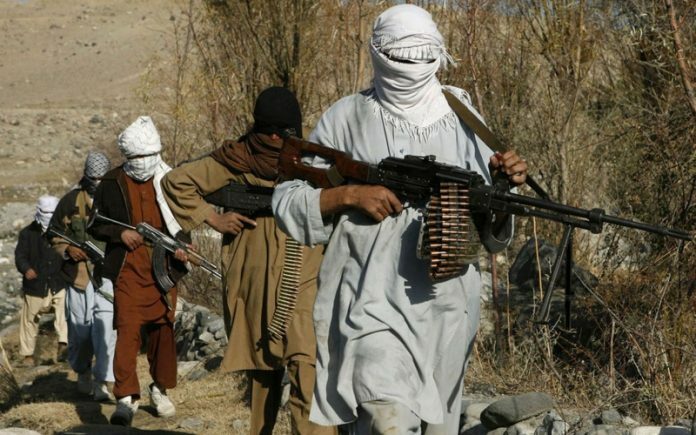 Moreover, the Pakistani military’s offensive in Waziristan has pushed Central Asian ISIS supporters into northern Afghanistan, with Tajik radicals resettling in Afghanistan and others returning back home. 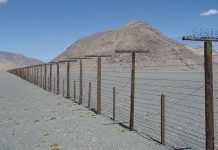 Tajikistan’s Interior Minister Ramazon Rahimzoda has estimated that there are between 10,000-15,000 militants along the Afghan-Tajik border, many of whom have cross-border connections. Indeed, Asadullah Omarkhail, governor of Afghanistan’s Kunduz province argues that “around three thousand Taliban fighters are active in Kunduz [and are receiving] Russian and Tajik support.” While claims about state assistance from Russia and Tajikistan to the Taliban are suspect, the group undoubtedly receives support from individuals in both countries, many of them Tajiks. Tajikistan’s government takes these cross-border links seriously, and has recently ordered mobile phone providers to being re-registering all SIM cards in the country in order to thwart terrorists. First deputy head of the State National Security Committee, Mansurdzhon Umarov explained the move, stating that “we have information that on the border with our country, insurgents with the Taliban movement are actively using Tajik SIM cards.” Tajik SIM cards are popular in the region as they are cheaper, and some cases provide better service than those issued by Afghan service providers. 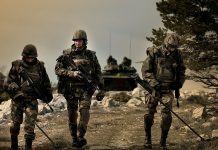 While the Afghan-Tajik border presents the greatest security challenge, the situation in neighbouring Uzbekistan holds important lessons, and warnings for Tajikistan. Like in Tajikistan, the Islamic Movement of Uzbekistan (IMU) emerged out of resistance to a long-time leader and vehement anti-Islamist, in this case Islam Karimov. Likewise the IMU has long had cross-border dealings with the Taliban in Afghanistan. Despite this, the leadership of the IMU pledged loyalty to ISIS, with IMU emir Usman Ghasi aligning the group with Daesh in June 2015. This move caused a split in the IMU, with a splinter group retaining the IMU name, and re-affirming its allegiance to the Taliban. 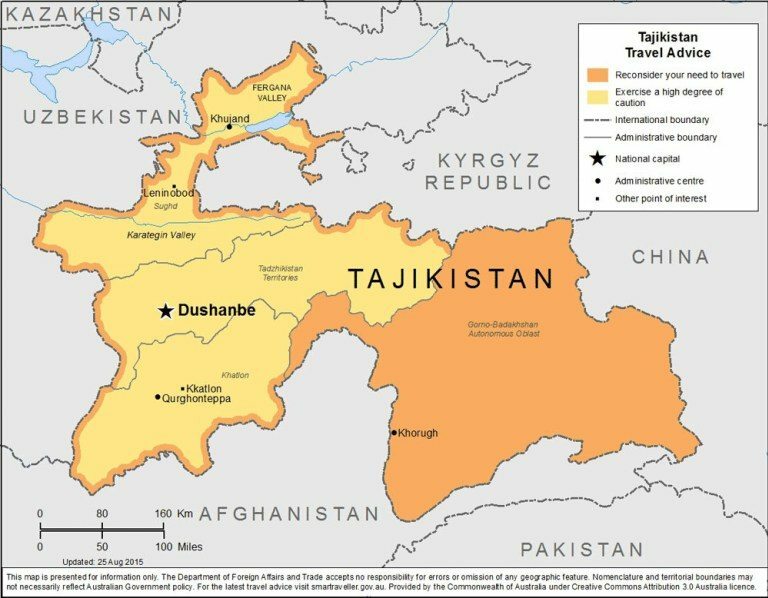 The existence of Jamaat Ansarullah, a Tajik IMU splinter group further connects events in Uzbekistan and Afghanistan to Tajikistan. What happened in Uzbekistan could easily happen in Tajikistan as ISIS supporters return home and continue to push radical Islamist goals. If the government continues its hard-line approach, these radicalized individuals are likely to act against the very government whose actions initially pushed many towards radicalization in the first place. This will create tensions between these returning ISIS expats and established local, anti-government groups. The latter has ties with ethnic Tajiks in the border regions of Afghanistan and China as well as with the Taliban. Given the existing Taliban-ISIS rivalry, Tajikistan could well see the development of a proxy-war among rival Islamist groups, with ISIS and Taliban-backed groups attacking each other as well as the government. This would in turn transform Tajikistan from an exporter to an importer of radicals, as international supporters of both ISIS and the Taliban heed each side’s respective call for support. Previous articleWhy Are Turkish Equities Performing So Well Despite Macroeconomic Turbulence?